Deb, an instructor at Michigan State University, wrote us a few weeks ago in the midst of grading projects. As she read the final versions, she saw problems she thought she and peers had mentioned in previous drafts. But, she wasn’t sure. She needed to review the writer’s revision history in order to identify the leaky pipeline between feedback and revision. Click “Roster” from anywhere in your course. Click the name of any student. Click the “Task Submissions” tab. The Task Submission report is an archive that provides an overall snapshot of every task the writer completed (writing, review, and revision). Deb can click on the name of any task to see all the feedback the writer received during a review, or to see the revision plan or revision the writer made. With these analytics, Deb was able to affirm, for herself and for the writer, that the review process generated helpful feedback. Armed with evidence that good advice was ignored, she was able to write an end comment that directed the writer to missed opportunities for stronger revision. We talk about the ways Eli solves the coordination hassles of peer review, but Deb’s question highlights that simplified coordination also leads to better coaching. 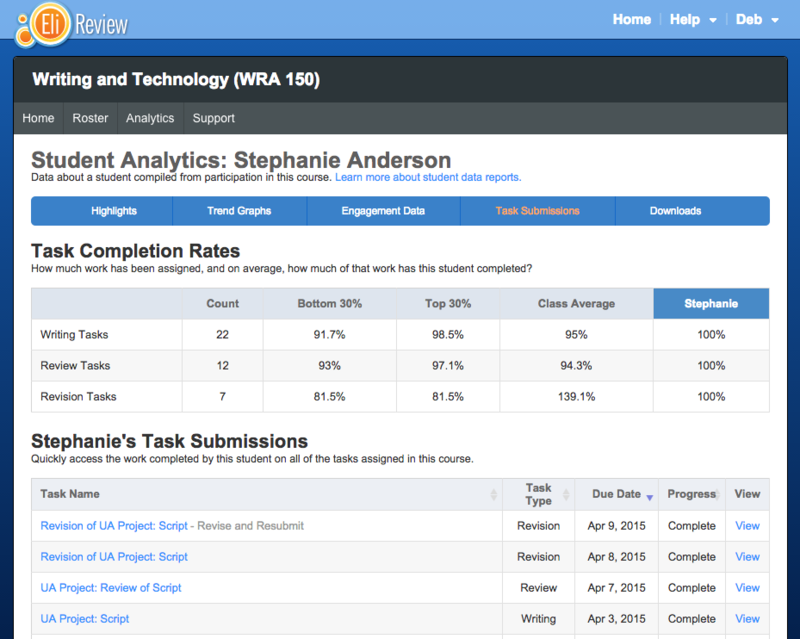 The Task Submission display is just one of the features available in Eli’s Course Analytics reports. You can learn more about the other analytics in the Eli Review User Guide. Got a question about how to get the most out of Eli Review before the term winds down? Write us at [email protected], on Facebook, or on Twitter. Assessing Writer Engagement Across Activities was published to the Eli Review Blog in the category Uncategorized.